We are a carpet cleaning company in Perth who have gained a well-deserved reputation as the stain removal experts. Stain removal in carpets has become as much of a science as it is a trade. The advances in stain removal technology rely on being to identify the material in the stain and introducing solutions designed to specifically break down the material so it can be removed completely for your carpet’s fibres. We take the stain removal portion of our business very seriously and are constantly being updated on new and effective ways to treat and remove a variety of different materials from your carpet. Because of our diligence, we have gained a thorough knowledge in the science of stain removal form carpets and upholstery and we even publish a list of techniques and solutions that the homeowner can safely try themselves. These techniques involve techniques and household cleaning solutions for various types of stains. We’ve labelled the difficulty level in dealing the types of stains listed. But some types of stains are extremely difficult to remove and better left to us to deal with. We’ve marked these troublesome stains with red boxes to alert the DIYers. The key to effective stain removal is knowing the material that is causing the stain so an effective solution can be used to chemically break down the stain. It can then be removed completely from the carpet or upholstery. This means that it’s unwise to try and treat a stain unless you know exactly what it is made of. Treating an unknown stain with the wrong solution can serve to permanently embed the stain in your carpet fibres. We have the knowledge on how to approach those stains that are an unknown quantity, and in most cases effectively remove them without setting the stain, or in extreme cases we can remove the dyes from the fibres and then recolour them back to their original colour instead with dyes designed for carpet fibres. Light coloured marks and blemishes in your carpet are rarely stains and these require a special treatment. They are often a section of your carpet that has had the carpet fibres permanently bleached of their colour. Household bleach, nail polish remover many supermarket stain removal products or household cleaning products and pet urine are generally the culprits in these cases. The original carpet colour must be restored to these blemishes and we have the means to accomplish this also. It involves a process called spot dyeing and it’s often the only remedy short of replacing the entire carpet. 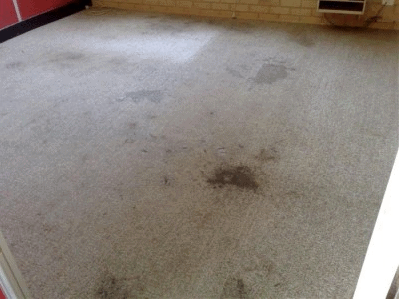 Whether you require stain removal services or spot dyeing, Fresh Aire Carpet Cleaning are the experts in Perth in both types of carpet-saving treatments. Call us whenever you have a spill or damage to your carpets or upholstery. We might save you a lot of money in carpet replacement costs.